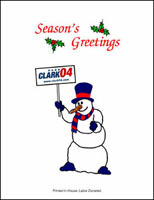 The Clark campaign produced several designs in house including the one above. The Dean campaign offered five seasonal designs in the DeanInvite section of its website. The images wereaccompanied by quotes from his speeches; the quote that went with this one was: "You have the power to reclaim our nation's destiny. And we have the power to take the White House back in 2004." "Trying to think of the words for the Holiday Card." "Words? Like the words Daddy says?" "Yes. What words do you think we should say to our friends?" -Conversation between Emma Claire and her parents, November 1, 2003. We wish you and your family all the joy and blessings of this holiday season. It's a special time of renewal and hope. Happy Holidays and a great New Year! 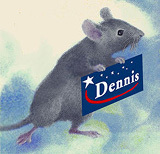 The Kucinich campaign posted online greeting cards by five artists. This one, by Barbara Helen Berger, is titled "Word of Mouse." with Dennis Kucinich and friends. 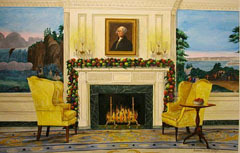 Artist Barbara Ernst Prey of Oyster Bay, New York produced a watercolor painting of the fireplace and decorated mantle of the Diplomatic Reception Room during the holidays. According to a White House press release, "On Friday, November 28, over 1.5 million Christmas cards bearing a Crawford, Texas postmark will be mailed to friends and family of President and Mrs. Bush, as well as foreign dignitaries." 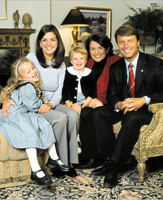 President and Mrs. Bush's message: "You have granted me life and loving kindness; and your care has preserved my spirit. Job 10:12 (NASB) May you celebrate the joys of faith, family and friendship this holiday season and always. 2003"
Illustration by Alexander Hunter. Among the the ornaments on the tree are ones labelled "Team Leader," "72 Hr." and "Voter Reg." 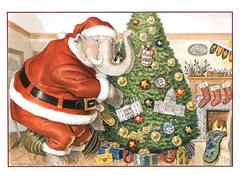 The stockings over the fireplace are labelled Schwarzenegger, Barbour and Fletcher, marking three Republican governors elected in 2003. The message inside reads, "As we prepare for the opportunities ahead, we are thankful for the support of all our good friends. We wish you the best of holiday seasons and the brightest New Year."